Mark Seed is passionate about personal finance and investing and is the blogger behind My Own Advisor. Mark is currently investing in dividend paying stocks on his journey to financial freedom. He is almost halfway to his goal of earning $30,000 per year in tax-free and tax-efficient dividend income for an early retirement. You can follow Mark on his path to financial freedom here. I wasn’t always a dividend growth investor. In fact, for a good part of my 20s, I wasn’t much of an investor at all. As a young Canadian kid fresh out of university having secured my first full-time (real) job at a major pharmaceutical company, I didn’t think very much about my financial future. Sure, I knew enough to “pay myself first” (and I did) to the tune of about $50 per month in my registered investment account, similar to a 401(k), but I was focused on living for today. And who isn’t for the most part in their 20s – you only live once right? As you get older in life, you realize more and more you don’t know what you don’t know. You also figure out when it comes to investing in particular, by owning some pricey mutual fund investments, you’re paying steep money management fees for products that have no chance to outperform the market over time. You also learn the fees paid in money management fees is money you’ll never see again. It’s a massive double-whammy that occurs in Canada, and the United States, and pretty much anywhere around the world. This is part of the reality check that led me to dividend growth investing. The other wake-up call I had was about eight years ago - at the start of the 2008-2009 financial crisis. My portfolio was down deeply in value so I started to ask lots of questions I couldn’t answer at the time. Why are my “safe” investments tanking in price so much? What should I do? Sell and get out of these investments? If I sold these investments, what are my alternatives? Will my investments ever come back in value? Lots of questions, few answers. It was a frustrating time that inspired me to learn more about the world of investing so I could better manage my money, my behaviour and my future. • By keeping your money management fees low, you keep more money for yourself. • No financial “expert” can accurately predict the future. • You should ignore economic forecasts and treat them as entertainment. • Your savings rate is a key to financial freedom. • You need to keep taxes and inflation in mind when making any investment decision. • The returns on stocks will be greater than bonds and those returns on bonds will be greater than cash, over time. • (In Canada), it makes sense to maximize contributions to registered investment accounts before investing in taxable accounts. • Stocks will go up and down in price in the short-term but will rise steadily in price, overall, over time. • By diversifying your investments (across different companies, different sectors, different countries and different asset classes) you reduce the risk of losing any money in your portfolio, over time. • Companies can reward shareholders in some different ways: reinvest profits to grow the business, buy back shares to increase share value, or pay dividends. • Some companies have paid shareholders dividends for generations. • Some companies continually growth their dividends, every year. • The dividends paid to shareholders is real, tangible cash. • The dividends paid to shareholders can be reinvested, to buy more company stock free-of-charge. • If dividends are reinvested, money that makes money can make more money. • In the asset accumulation phase, you should cheer for falling stock prices. Once I realized these investing principles, and more, I decided that investing a good portion of my portfolio in dividend paying companies, mainly dividend growth companies, is a smart way to invest. By owning dividend paying and dividend growth companies, I collect and reinvest the dividends paid by the companies I own to buy more shares each month and quarter. My beginnings were humble. I recall my first dividend growth stock was a Canadian pipeline company called Enbridge (ENB). I sunk $500 into this stock back in December 2008. I used the Enbridge stock transfer agent to buy my shares. (Using the stock transfer agent, I could buy new shares commission-free to build up my position in Enbridge over time.) When I had enough money invested in Enbridge, so when Enbridge dividends were paid, the dividends bought the shares (instead of me), I moved this stock from the transfer agent to my brokerage account. I repeated this cycle for a few other Canadian stocks in 2009, 2010 and 2011. Eventually what was established was a small, dividend income machine. The Canadian stocks I owned paid dividends each quarter and when dividends were paid, those dividends bought more shares of each quarter. With the dividend income machine initiated, I turned my attention to owning more companies, in different industries, in different countries, that also had a long, established history of paying dividends and growing their dividends. The meager beginnings of owning one stock (Enbridge), in 2008, grew to owning a handful of stocks by 2011. The handful of stocks grew to a dozen in 2013 and at last count, I now own about 40 dividend paying companies from Canada and the United States. These include the Canadian banks such as Royal Bank (RY), TD Bank (TD), insurance companies (think Sun Life), pipeline companies (think Enbridge), telecommunication companies (think Rogers and BCE (BCE)), energy companies (think Suncor) and utilities (think Fortis and Emera). All these companies pay dividends – I don’t own any companies that don’t. With most of these companies, dividends are reinvested every month and quarter to buy more shares. My lesson learned about money that makes money, can make more money – is true. I see it every month. Every month on my site, I share my dividend income update on my path to financial freedom. My wife and I are fortunate to have small pension plans from our workplace, and we’re working to pay off our mortgage debt aggressively. We believe being debt-free, owning a number of dividend paying stocks that provide income coupled with a couple of super, low-cost indexed products in our investment accounts, is the get wealthy eventually path to financial freedom. So far, our plan is working. At the time of my last report, we’re on pace to earn $15,000 this year from our dividend paying companies alone. This is money we never have to work for again. 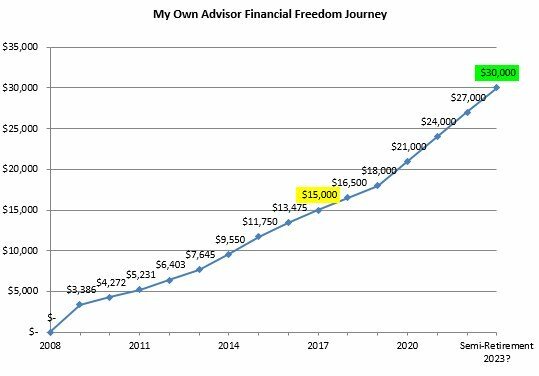 Earning $15,000 per year in tax-free and tax-efficient investing accounts is like having a part-time job we never have to show up for. This income is ours to keep (but reinvest for now) for as long as live – income earned from our capital. Generating passive income resonates with me. For some, the markets may not be the best way to do that because some investors can’t tolerate the volatility of seeing their account balance fluctuate like a yo-yo. I get this. I believe one way around this is to focus on the income that your portfolio is generating, rather than focusing on the capital balance you have. Dividend growth investing is not for everyone. There are risks. There is the temptation to chase high yield stocks. Don’t. There is a desire to own “hot stocks” that pay dividends. Don’t. There could be a lack of diversification – so get diversified as much as possible over time and strongly consider owning most of your portfolio in broad-market indexed funds (like I do) for insurance. There are no guarantees that come with any investing approach and all investments have some form of risk. Ultimately you need to decide what your investing approach needs to be and what you can stick with. That said, I believe dividend growth investing can be an attractive strategy for those that plan to retire earlier than the traditional age. Our investment goal to reach financial independence, is to own a $1 million dollar stock portfolio churning out dividends to the tune of about $30,000 per year. Once we reach that point along with our other assets, including a debt-free home, we’ll have the flexibility and freedom to decide what we want to do, when we want to do it. We may decide to travel more, we may decide to work part-time, or not work at all. We don’t know. We do know that passive income, from our dividend income machine now, is in full flight. We’ll stay this investing course regardless of what the market does, irrespective of what the financial gurus tell us to do, while striving to keep our investments, diversified, tax-efficient and money management costs as low as low for as long as possible. My 20-something self said you only live once. I encourage you to figure out what you want from your future self and find the best investment path to take you there. Live and continue to learn. When it comes to good money management – you can get wealthy eventually.